Antonio Angelo Chiappone first appears in the Painesville, Ohio, area in 1913. 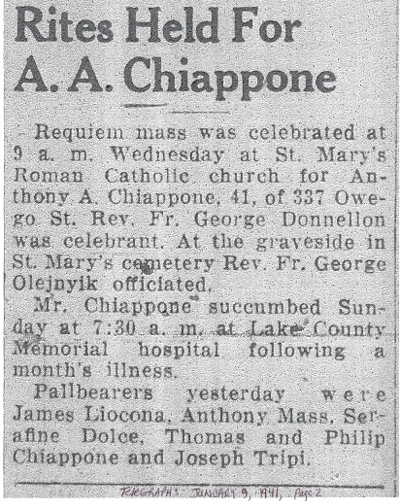 In America, Antonio Angelo Chiappone was known as Anthony Chiappone. Antonio Angelo Chiappone, son of Gaetano Chiappone and Angelina Pecoraro, was born on February 19, 1899, at Montemaggiore Belsito, Sicily. He married Agata Guccione, daughter of Salvatore Guccione, in 1923 at Italy. 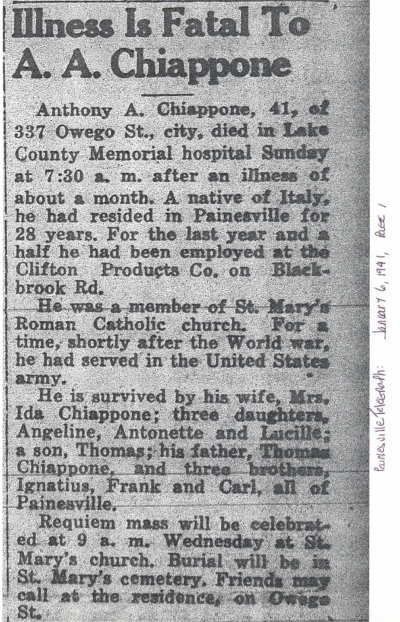 Antonio died on January 5, 1941, at Lake County Memorial Hospital, Painesville, Lake County, Ohio, at age 41, of pneumonia. Antonio Angelo Chiappone immigrated to the United States on April 5, 1913, at age 14. He was travelling to Painesville, Lake County, Ohio, to join his father, Gaetano Chiappone. Antonio returned to Italy in the early 1920’s to marry. He returned to Painesville on June 3, 1923, with his new wife. At the time of death, Antonio resided at 337 Owego Street, Painesville, Lake County, Ohio. 1. Angeline Chiappone was born on January 30, 1924, at Painesville, Lake County, Ohio. She first married Eugene Crowl. She married second, Joseph Bodai. Angeline died on February 1, 2006, at Sunset Manor, Geneva, Ashtabula County, Ohio, at age 82. Her body was interred at Evergreen Cemetery at Painesville, Lake County, Ohio. 2. Mary Antoinette Chiappone was born about 1926, at Ohio. She married Phillip J. Latona, son of Pietro LaTona and Epifania Pace, about 1948. 3. Thomas J. Chiappone was born on October 11, 1928, at Painesville, Lake County, Ohio. He married Phyllis Palsse, daughter of E. Mathew Palsse and Estelle Suonio, about 1949. Thomas died on August 12, 2009, at Salida Woods Assisted Living, Mentor, Lake County, Ohio, at age 80. His body was interred at Riverside Cemetery at Painesville, Lake County, Ohio. 4. Lucille Chiappone was born about 1936, at Ohio.